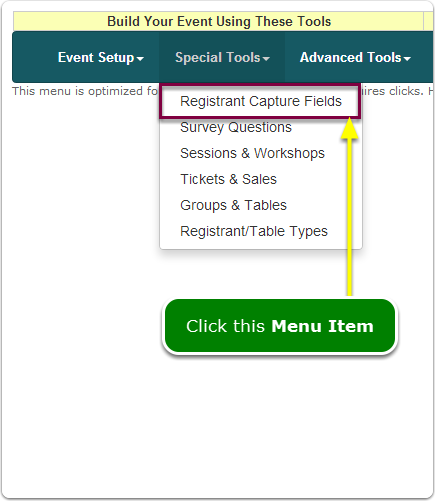 Help Documents - Version 5 Capture Registrant InformationHow do I change existing registrant information capture fields? Where does the About You section appear on the registration page? Someone else registers for the registrant - typical scenario: an admin assistant registers 4 executives using their respective email addresses. The assistant would enter their email address into this field and therefore would receive a copy of every email address sent to the registrant. This includes confirmation email messages, reminders to attend, session notifications as well as any other messages the event organizer sends. 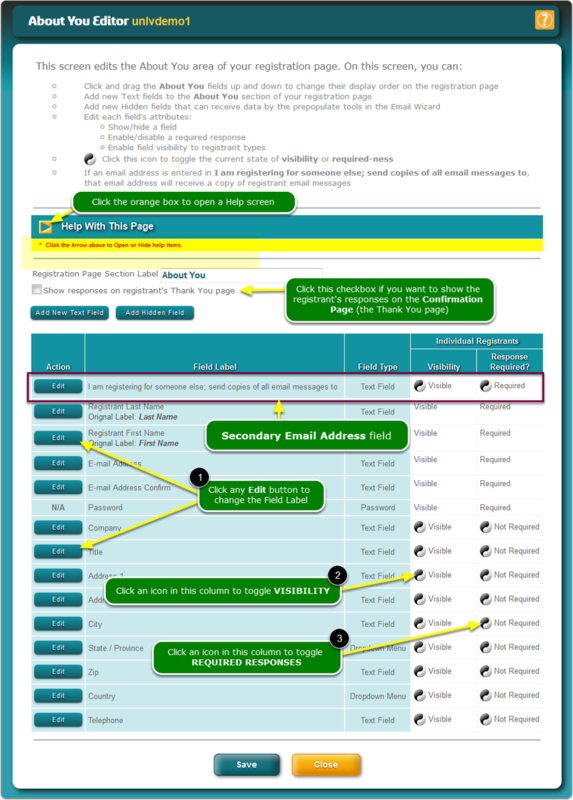 Registrants need to have all of their email messages sent to, say, a home and a work email address. What problems can occur by changing a Field Label? If you change the label of a DEFAULT FIELD, the Original Label is displayed underneath your new label so that you can return it to its original if you created a problem and want to return to the original label. See the yellow highlighted sections below. The DEFAULT FIELDS are displayed in the Registrant List Report, which is the primary screen used to manage your registrants. Changes to the field attributes should be done carefully and thoughtfully, particularly when you have registrant types and group registration enabled. All field labels may not apply to the various combinations of registrant modes. DO NOT CHANGE THE FIRST AND LAST NAME FIELD labels to capture some other piece of information - you can prefix them, such as Patient First Name, Registrant First Name, Attendee First Name, etc; never change the label to something else such as Hair Color, Automobile Type, etc. 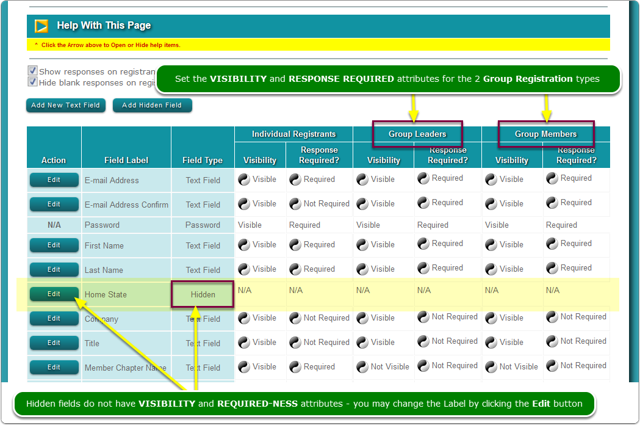 Zoom: What problems can occur by changing a Field Label? What if I have Group Registration turned on? You will see four more columns to the right of the screen (Group Leaders and Group Members. 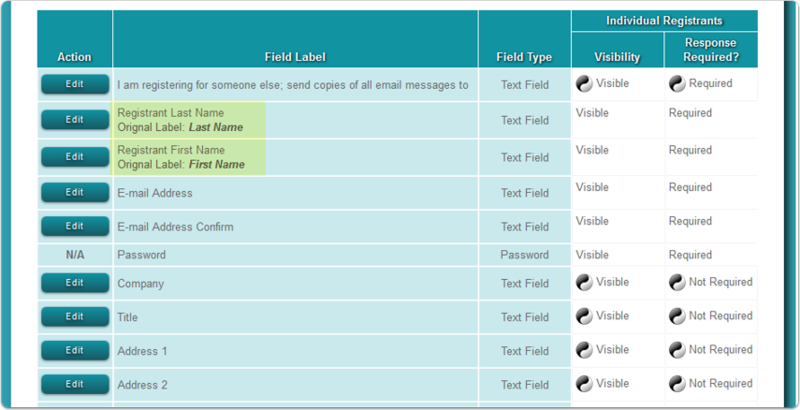 You can set the VISIBILITY and the RESPONSE REQUIRED attributes for Group Leader and Group Members independently. Zoom: What if I have Group Registration turned on? If you make any changes to the About You section's fields (either changing existing or adding new), then make sure you do a thorough test to make sure all of your changes display correctly. Testing is even more critical if you have Registrant Types and/or Group Registration turned on. Next: What is the Secondary Email Address field used for?